Charles Haddon Spurgeon possessed a deep and abiding reverence for the authority of God’s written word to the end of his days. His recognition of how daily life both wounds and affects believers, together with the Biblical antidote rightly places him as a spiritual giant in the eyes of many Christians. Spurgeon was only nineteen when he first preached at New Park Street on December 18th 1853. As we read these daily notes abridged from the New Park Street era (long before his well-known days at London’s more famous Metropolitan Tabernacle), we can sense the extraordinary vitality which characterized his preaching, together with the wonderful unction attending his ministry in those early years. 365 days with Spurgeon contains a useful Scripture and subject index section, together with a unique guide to where and when Spurgeon preached. 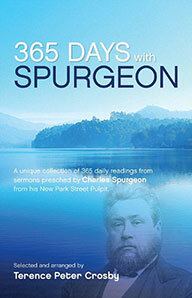 If your usual daily devotional is becoming rather familiar, 365 days with Spurgeon will provide a welcome change. If you are wanting food for the soul, you will find ample in these pages. This book contains extracts from Spurgeon’s early Metropolitan Tabernacle ministry and also includes further reading from the Scriptures with Spurgeon’s comments and thoughts for meditation.